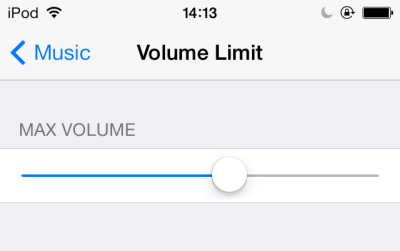 By default in iOS, no maximum volume restriction exists. Therefore, children can turn the volume up to the highest point possible. A sustained loud volume can damage your hearing permanently. Therefore, it is recommended that you reduce the maximum volume to a safe range to avoid hearing loss. The maximum volume of iOS devices is 100 dB, while a safe volume range is about 70 to 80 dB. If you usually listen to music at full volume, you should consider changing this habit. Over time, listening to any audio at a high volume can lead to hearing loss. This is especially true for children. Many experts recommend that, for safety reasons, you should listen to music at 70 percent or 80 percent of the maximum volume only. The steps below will help you configure the maximum volume range on an iOS device so that you are always in a safe volume range. Please note that this configuration is for the stock music app that comes with iOS only. If you are using a third-party music player, these steps will not work. 1. First, go to the Settings section. 2. In the Settings screen, scroll down, choose the Music option, and then go to Volume Limit. 3. By default, this option is turned off. Move the slider to the left side to turn it on, and decrease the maximum allowed volume. 4. Return to the previous page to save the change. Now, launch the music app. Play a song, and you will notice that the volume is lower. Continue making changes to the maximum volume until you find a suitable volume range.